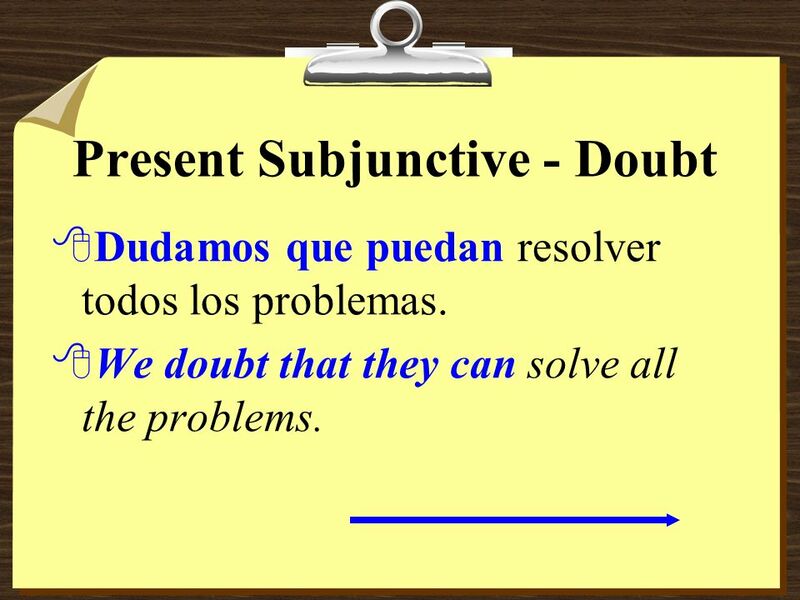 3 Present Subjunctive - Doubt 8You have used the subjunctive to say that one person tries to persuade another to do something. 8It is also used after verbs and expressions that include doubt or uncertainty. 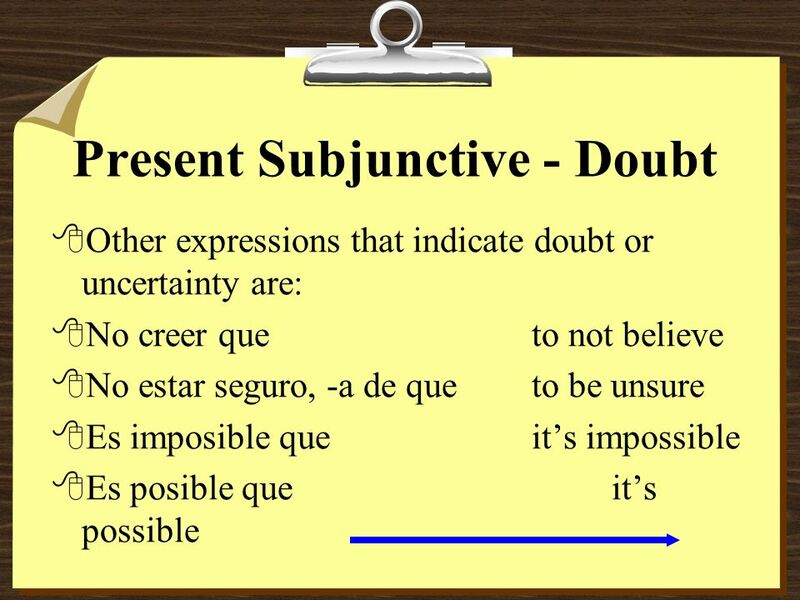 4 Present Subjunctive - Doubt 8Dudamos que puedan resolver todos los problemas. 8We doubt that they can solve all the problems. 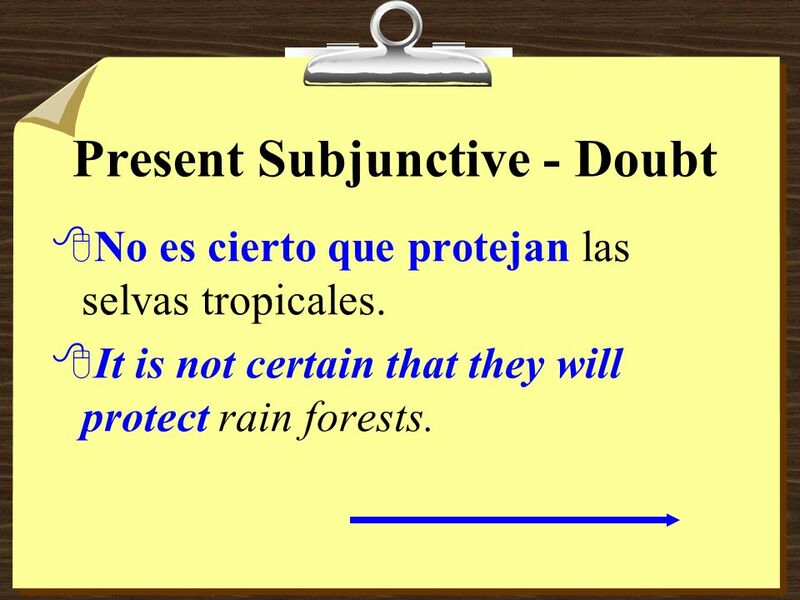 5 Present Subjunctive - Doubt 8No es cierto que protejan las selvas tropicales. 8It is not certain that they will protect rain forests. 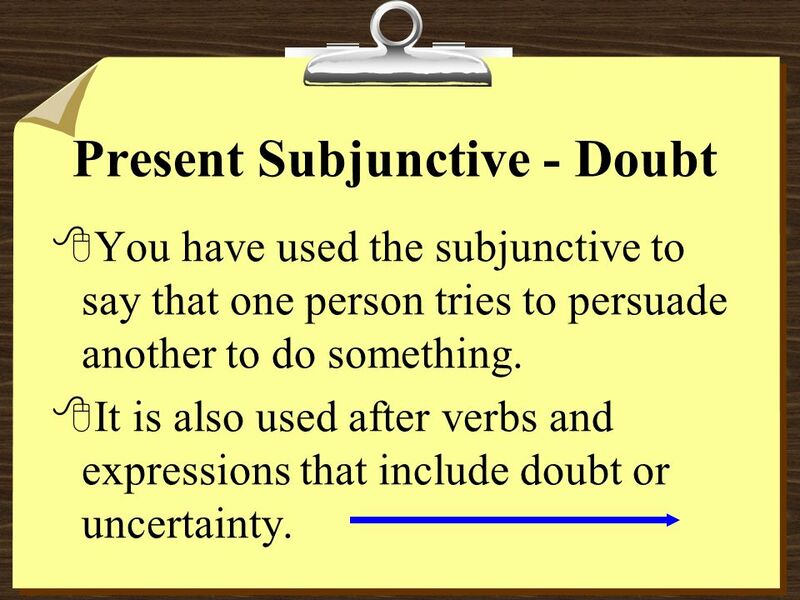 7 Present Subjunctive - Doubt 8When the verb or expression indicates certainty, use the indicative, not the subjunctive. 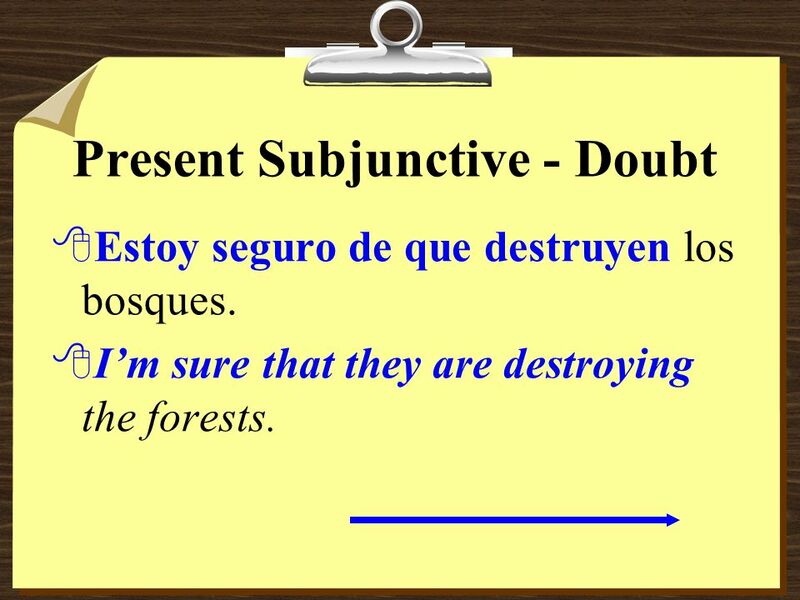 8 Present Subjunctive - Doubt 8Estoy seguro de que destruyen los bosques. 8Im sure that they are destroying the forests. 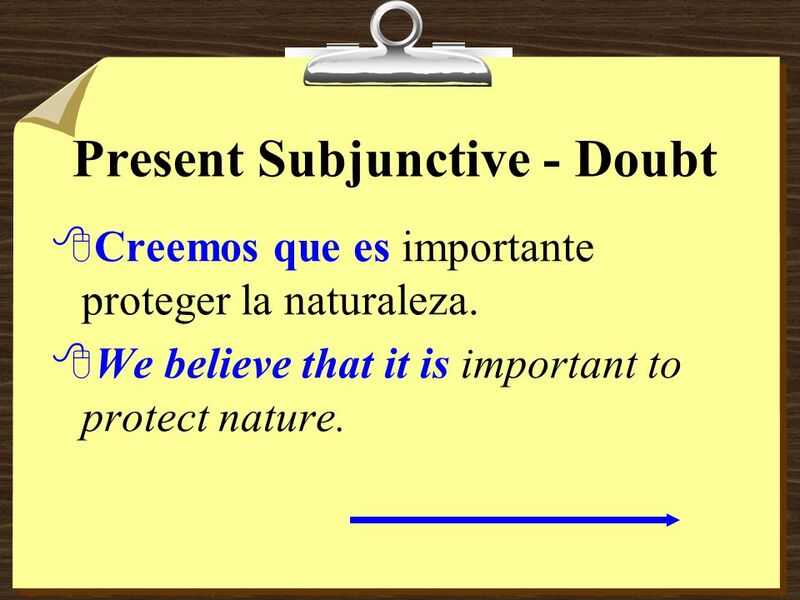 9 Present Subjunctive - Doubt 8Creemos que es importante proteger la naturaleza. 8We believe that it is important to protect nature. 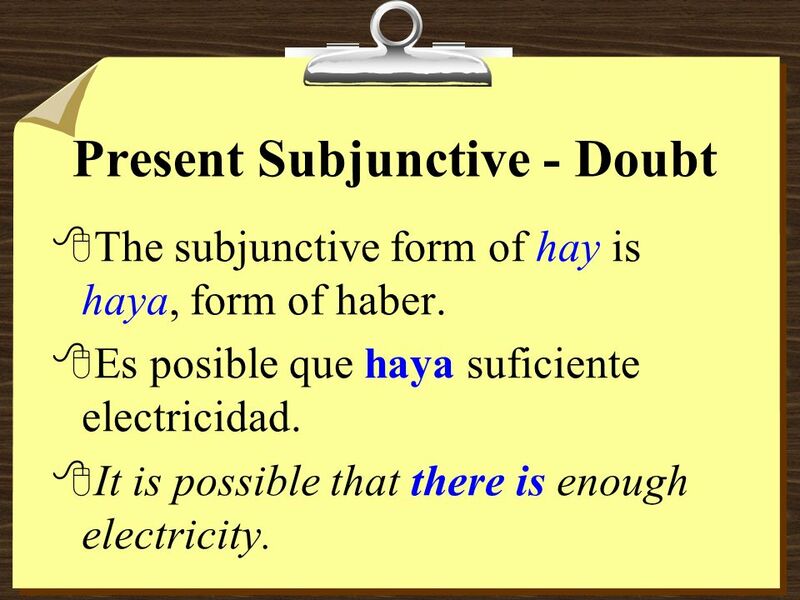 10 Present Subjunctive - Doubt 8The subjunctive form of hay is haya, form of haber. 8Es posible que haya suficiente electricidad. 8It is possible that there is enough electricity. 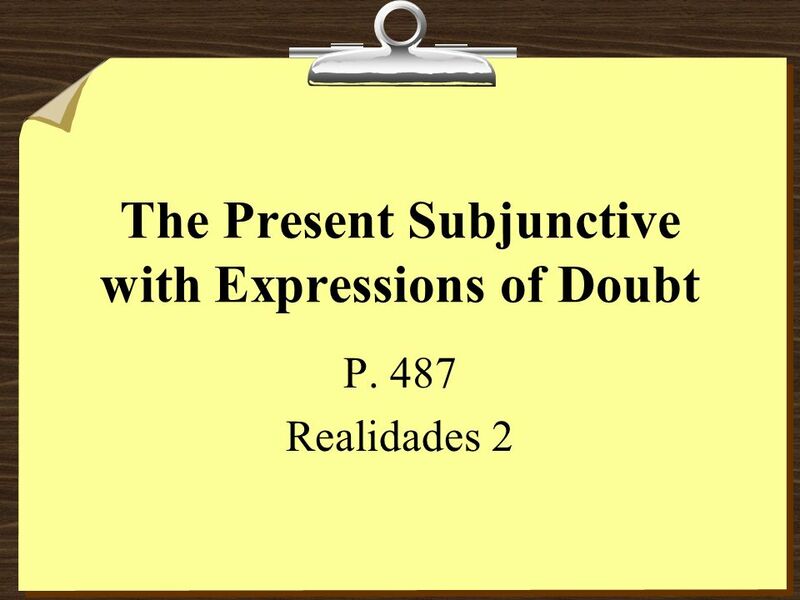 Download ppt "The Present Subjunctive with Expressions of Doubt P. 487 Realidades 2." In ENGLISH, the use of conjunctions in compound sentences will NEVER utilize the subjunctive. Ill take my umbrella in case it rains. Expressiones Used with the Indicative. Pensar queTo think that Saber queTo know that Creer queTo believe that No dudar queTo not doubt that No hay duda. Copyright © 2009 Vista Higher Learning. All rights reserved. 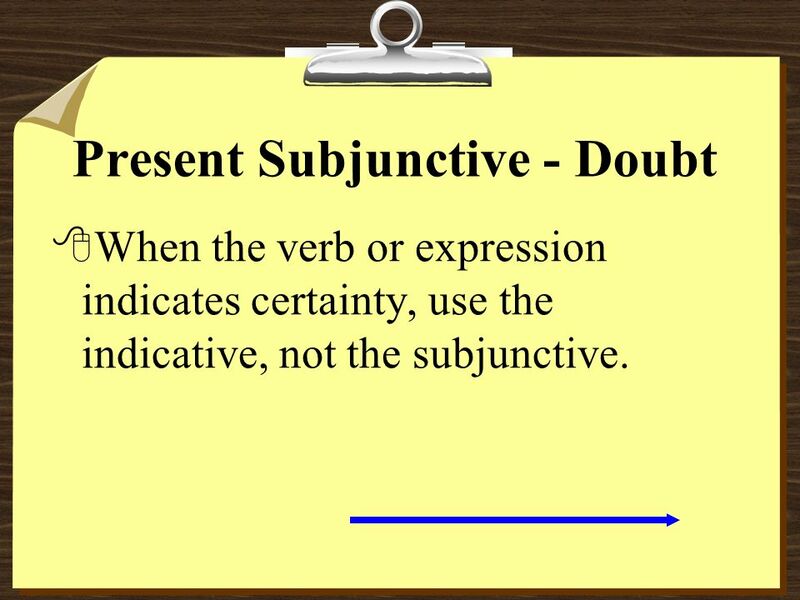 12.3–1 Subjunctive verb forms The chart on the following slide provides a summary of subjunctive. Sequence of tenses Imperfect and pluperfect Subjunctive TB p. 221. He can speak English not He can to speak English not He can speaking English She should go to the doctor not She shoulds go … not She should goes…. They. Copyright © 2008 Vista Higher Learning. All rights reserved. 4.1–1 Forms of the present subjunctive The subjunctive (el subjuntivo) is used mainly in multiple.